BG Door, a supplier of gastight doors, will launch two innovative products. In Berlin, market experts were able to experience the benefits of the brand new gastight pass door for ripening room doors. Next to this innovation BG Door showcased its adjustable side curtains for ripening room interiors. Managing Director Jan van Kessel about BG Door's never-ending drive for innovation: "Whether it is technical improvements or new market entries, we are always looking for ways to innovate and keeping track of changes in the market. Flexibility and innovation are key ingredients for our business success and that of our customers". BG Door launched its new gastight pass door for ripening room doors at Fruit Logistica. 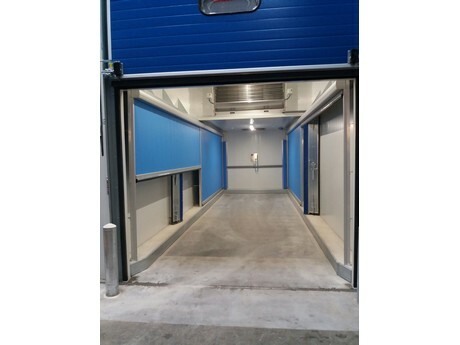 This pass door is fully integrated in the sectional door and makes it easy to access for product quality control. This integrated door is matching air permeability Class 6 and meets the world's highest safety regulations for emergency exit. The gastight pass doors of BG Door are available in standard grey/white and optional in many other colours. Just in 2019, BG Door has already added new products to their ripening room interior components. 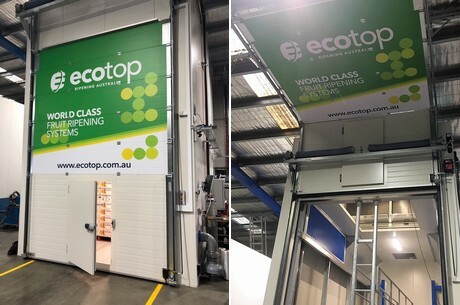 For even better control of the ripening process of tropical fruits like avocado, mango and many others, the ripening room experts developed adjustable side curtains. The curtains are electrically operated and in height adjustable – ensuring an optimal airflow when different pallet heights are being used. A great innovation for better control of the ripening process. New and existing ripening rooms can now be easily equipped with adjustable part load boards for partial loaded rooms. Keeping track of changes in the market?